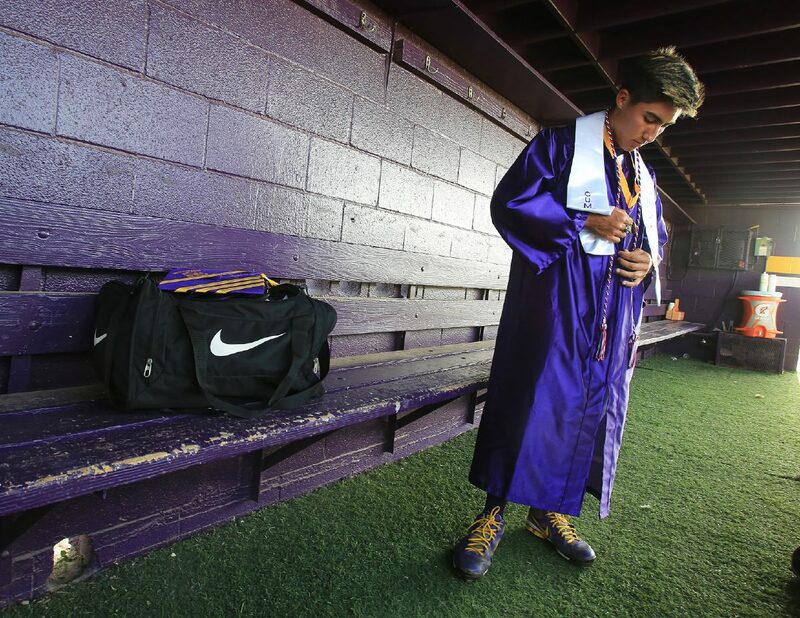 McAllen High baseball team member Roy Quintanilla readies himself before graduation ceremony at Ted Uhlaender baseball field on May 25, 2017 in McAllen. A ceremony was held for the graduating seniors because the team will play in a regional semifinal game against San Antonio Churchill in Laredo this weekend. McAllen High plays San Antonio Churchill in the Class 6A Region IV semifinals in a three-game series that begins at 7 p.m. tonight at Uni-Trade Stadium in Laredo. The distance from the Valley to San Antonio presented a challenge as the teams tried to arrange a home-and-home series, so the next step was to try to find somewhere in the middle. The coaches decided the best fit was Laredo, which made it impossible for McAllen High to be in town for the school’s graduation ceremony at 9 a.m. Saturday at the McAllen Convention Center. The coaches and McHi administration decided it would be best to have a special ceremony to honor the 12 seniors on the team who would not be able to attend their scheduled graduation. The school held a meeting with Pompa, his staff, other athletic staff and administration in attendance to try to come up with a solution. As the meeting progressed, Thursday became the obvious choice. McAllen High has 12 seniors on the roster: shortstop Roy Quintanilla, outfielder Victor Valdez, second baseman Keola Zamora, pitcher Ramiro Maldonado, outfielder Andrew Sanchez, utility player Enrique Rodriguez, infielder Aaron Alanis, infielder Darren Hernandez, outfielder John Rodriguez, catcher Joshuah Zapata, infielder Ivan Montemayor and outfielder Rick Garza. On Thursday, they gathered at McAllen High’s home field, Ted Uhlaender field, with friends and family. Each senior had his name called and walked up to home plate, where Canales offered congratulations and handed out a piece of paper signifying the completion of their high school education. Thursday night’s event was recorded, and during the regular ceremony on Saturday, each player will have his name called as the video is shown on the video boards.